Headers and footers in DataTable are enabled by the header and footer parameters and configured by the attributes header and footer in the columns parameter. Additionally, both header and footer can be rotated and take custom height. To define a simple (single line) header you should specify it as a string. You should use 'array' definition to split header into several sub-headers (each value of the array specifies a single sub-header). Note, you can specify different number of sub-headers for different columns (number of sub-headers is equal to number of values in array). To specify colspan (rowspan) in the header or put filter into it, you should specify the header as an object or array of objects. css - the name of a CSS class that will be applied to the column header. More information about built-in and custom filters is in the separate article. Headermenu can be customized. For more details, go to the Datatable Header Menu article. By default, headers are enabled whereas footers are disabled. So, before using footers - enable them. Same as with header, multiline footer is comprised of an array of texts for each footer line. css - the name of a css class that will be applied to the column footer. The library provides the summColumn counter that can be used to get the total value in the footer of a column. Note that this feature is available in Webix Pro edition only. To define rotated state for the header or footer you should specify it as an object (or array of objects in case of multiline header/footer). Header height will be adjusted to text size. It's also possible to enable autoheight for the header and the footer of DataTable. Thus the height of the header/footer will be adjusted to show its content. All content elements that can be integrated into the datatable header or footer are stored in a webix.ui.datafilter object and feature the same configuration pattern. node - HTML element (here: header td). 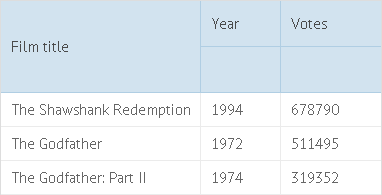 For datatable footer there is a prebuilt summColumn element that counts the sum from column rows and displays them under the main part of the datatable. A custom content element can be created totally from scratch. refresh() - defines dynamic performance of an element. And you may define as many methods as you need. trackCells (boolean) - indicates whether an element should be refreshed each time component data changes (if true, the refresh() method of a content element will be called automatically). 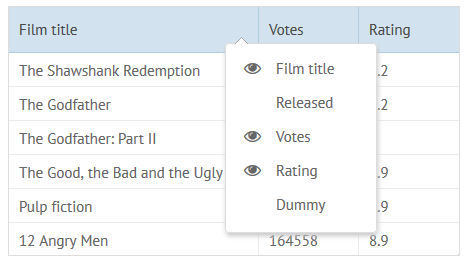 You can embed a filter into the header of the datatable as a custom content element. 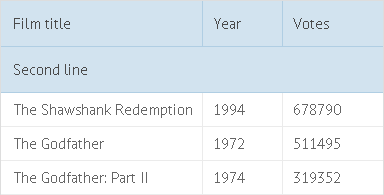 In the above example we have added two filters into the datatable header: a custom filter and a standard text filter. Data will be refiltered each time the value in any of the filters changes.